Hello there! Today's post is very special because Concord and 9th is turning one this month and we are here to celebrate! Greg and Angie have organized an amazing month-long party with a blog hop, giveaways, discounts and much more! There will be special guests every day in August and each one of them will be giving away a 20$ gift card to Condord and 9th! So don't forget to visit their blog daily! In order to qualify for today's gift card follow the instructions at the end of this post! ¡Hola! La entrada de hoy es muy especial porque "Concord and 9th" cumple un año este mes ¡y estamos aquí para celebrarlo! Greg y Angie han organizado una fiesta increíble con un "blog hop" que dura todo el mes, regalos, descuentos ¡y mucho más! ¡Habrá diseñadores invitados cada día y cada uno de ellos regalará una tarjeta de 20$ para la tienda de Concord and 9th! ¡Así que no os olvidéis de visitar su blog diariamente! Para participar en el sorteo de hoy solo tenéis que seguir las instrucciones que he dejado al final de esta entrada. And to join the birthday bash I have created these cards using two of my favourite Concord and 9th products: "Layers of Love Die" and "Love you. Mean it". Y para unirme a la celebración, he creado estas tarjetas usando dos de mis productos favoritos de Concord and 9th: "Layers of Love Die" y "Love you. Mean it". Making these cards was surprisingly fast. The most time-consuming part was the white embossed background, but once that was done I had everyghing ready in less than twenty minutes. You can watch how I did it in the video below or at my Youtube channel. Hacer estas dos tarjetas ha sido increíblemente rápido. Lo que más tiempo me ha llevado es el fondo embosado, pero una vez hecho eso solo he necesitado veinte minutos para acabarlas. Podéis ver cómo lo he hecho en el vídeo que dejo aquí abajo o en mi canal de Youtube. I'm a big fan of Concord and 9th and that's not only for their amazing products but also the great people behind it. So Happy Birthday Concord and 9th! Here is to many more! Soy muy fan de "Concord and 9th" y no es solo porque me encanten sus productos sino también porque sus dueños son personas maravillosas. Así que ¡feliz cumpleaños Concord and 9th! ¡Que cumplas muchísimos más! Fill out the rafflecopter area below for a chance to witn a 20$ gift card to Concord and 9th. Rellena el área de aquí abajo si quieres participar en el sorteo de una tarjeta regalo de 20$ para la tienda de Concord and 9th. Your cards are both just lovely...those stencil brushes are fabulous for subtle shading...I have just purchased some from SSS. Clarity Stamps don't post to Tasmania :(...so I am very anxious for them to arrive...happy birthday C&9th! Love the soft blending and the way you use the hart i a different card. Beautiful color in both cards. Thanks for sharing your techniques! Amanda, they are both so beautiful, so tender and soft!!! Both cards are fantastic. I just purchased my first few Concord and 9th sets. I have a list of more that I want. Happy Birthday to you! The blending is so pretty! Ever so soft and pretty ... and lovely to see the positive and negative used. Super sweet and an great way to get two cards out of one color blending! Congrats to Concord & 9th on their first year - Happy anniversary!! Congrats Concord & 9th and thanks for the giveaway!!! Ya te lo he comentado en youtuve Amanda, las tarjetas son preciooosas! Las dos tarjetas son preciosas. Me ha extrañado la forma de aplicar las distress con brocha. Veo que el efecto final queda más uniforme que con los aplicadores.Gracias! Ha sido todo un descubrimiento. Both your card are very lovely. I like the colours you have used. And thank you for the video tooo. I love this card, it's so pretty! <3 Congrats to Concord & 9th! You're such an inspiration! I love the soft ink blended background! I just found your channel love your cards. Your are very talented. What a lovely card. I'm going to try to copy the look using old blush brushes I have. Thanks for the inspiration!! Happy Birthday,Concord & Ninth. I love your stamps and Amanda your cards wre beautiful. I can't decide which one I like the best. Your cards and pretty. I like the soft colors. Absolutely gorgeous cards and THANK YOU for the video! So impressive to see the magic unfold! Just added the heart dies to my wish list! Forgot to add (because your cards distracted me...I was busy swooning), to say "Happy Birthday Concord and 9th!" These are so beautiful!! I love the soft colors and small images. The heart details are so so pretty. These are beautiful! Love the soft colors and pretty details! Love that gorgeous heart die! Happy Birthday to Concord & 9th! Love your cards and the heart die.. On my must have list now. Me encantaron las dos tarjetas... Muchas gracias por compartir y por el giveaway... felicidades a ti por alcanzar los 25k subscritores!! I love the heart die so, delicate and pretty. The colors are such a great match with the card. Great job! Happy Birthday Concord and 9th! And gorgeous card!!! ¡¡¡¡Preciosísimas!!! Qué sencillas y elegantes. Una pasada, como siempre. Qué chulos los productos de Concord and 9th. Felicidades. Your cards are beautiful! 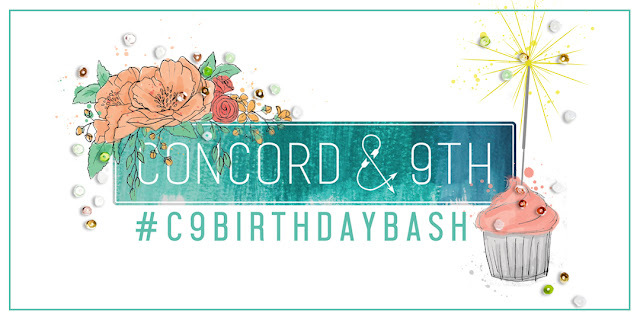 Happy BD to Concord & 9th! Happy Birthday to Concord and 9th - we share the same birthday :-) Those cards are beautiful! I forgot I have that die set - and now I have a new way to use it :-) Thanks! Me gusta muchas tus tarjetas! Son bonitas. (Y perdoname mis errores en espanol.) Gracias a tu creatividad. Oh my, these are just gorgeous. I don't have any Concord & 9th products yet but everything I have seen so far has been wonderful. Happy Birthday Concord & 9th, here's to many, many more! Happy Birthday Concord & 9th! And cheers to many, many more! Love your gorgeous, colorful cards, Amanda. Thanks for the inspiration. Such pretty and charming cards! Happy Birthday wishes to Concord & 9th! Absolutely gorgeous cards, Amanda! Love how you create the background and die cut. HAPPY BIRTHDAY to Concord and 9th! Super cute cards! Happy Birthday Concord & 9th! Love how soft the white one is, so pretty! Happy Birthday Concord and 9th! Two beautiful cards, Amanda! I love that you used the embossed heart cut from the 1st card to make another! A wonderful way to help Concord and 9th celbrate! Love your cards! Congrats on 25,000.00! Love Concord and 9th!! Your cards are gorgeous! Beautiful cards. Nice to see how you can use both parts of the die cut. make two from one cut! Hello Amanda! Both of these cards are beautiful!! I love the colors you chose!! The clarity brushes look like they blend better than the regular blending tools. It's great how you were able to make two cards with one die cut...which is a beautiful die cut!! Thanks for sharing!! These are such pretty cards. I love the soft colours. Happy Birthday Concord and 9th! Happy Birthday, Concord and 9th. I love the pastel colors on your cards. Beautiful cards with stamps and die from the awesome company Concord & 9th, happy birthday! Simplemente preciosas!!! felicidades a Concord and 9th que cumpláis muchísimos años mas!!!! These are sooo sweet! Happy birthday, Concord & 9th! Gorgeous cards! Love the soft colors! Love both cards. Love the die, layout and color choices. TFS! And happy birthday to Concord & 9th! Love the die and the colors you've used! So pretty! Love your cards and happy birthday to concord and 9th. Love both cards and ink blending! Lovely Cards!! Happy birthday to Concord and 9th! Beautiful cards & awesome color blending! Love them both! So very pretty - love the designs and soft colors ! Happy birthday Concord & 9th! Happy birthday conccord & 9th. Love the cards. I LOVE Concord & 9th! Probably my favorite stamp company right now! You are so talented. I love your card work. It always looks so beautiful and elegant. I am torn, I can't decide which project I like best. The fruity mice shaker card, or the little elephant, the birthday pop up card mistakes and all or these two. Congratulations on reaching 25,000. I am not surprised in the least, your work is amazing. Beautiful "positive/negative" cards. Love the soft subtle rainbow colors. Both cards are stunning. I can't decide which is my favorite! Very pretty cards Amanda, and happy birthday to Concord & 9th. Also congratulations to you on 25,000 subscribers WOW you so deserve it. Love the softness you achieve with the colours. Beautiful. Happy birthday Concord & 9th. Love your products. Your cards are pretty, now I need the heart die set. Thanks. Happy Birthday, Concord & 9th! More creative years to come. Very pretty cards. Good thing you didn't throw the heart die cut. I actually like that card more. Happy Birthday Concord and 9th. Love both of your beautiful cards. Such beautiful cards!!! HB to C&9th! Happy Birthday Concord and 9th! Such a beautiful card to help Concord & 9th celebrate their birthday!! LOVE their products!! <3 TFS! Beautiful cards! Thank you for the video, too. Congrats to you on the 25,000 and congrats to Concord and 9th! Happy birthday Concord and 9th!! Happy birthday!! What a fun time to celebrate!! Fabulous cards!! Happy Birthday Concord & 9th!! My fav stamp set is Love You..Mean It! It is so useful and I love the simple lines! Very, very pretty. I love getting two card videos in one! Thanks for sharing. So soft and pretty! Happy birthday C&9! Beautiful card love the soft colors. Great job. Love, love, love your cards!! Great way to use the negative part. Thanks for sharing your beautiful cards! Happy birthday Concord & 9th! Oh how I love how you made such a beautiful, soft background with the brushes! Absolutely stunning. It makes me think of babies with the gentle pastels. Do you find it easier to put down a streak free area with the brushes vs the usual distress sponge applicators? How do you decide which tool to use? Congrats on your subscription milestone! That's so exciting! And a very happy birthday to my favorite company.....Concord & 9th. Ive been eyeing the upper and lowercase sophisticated script stamps for weeks! Fingers are crossed! Happy Birthday Concord & 9th !!!! many, many more! Congratulations on 25,000 subbies!!!! WOW I love all your cards Amanda! Happy Birthday to Concord and 9th too! Those brushes look like so much fun!!! wow, so fabulous, Happy Birthday to Concord & 9th. Me gustó muchísimo la técnica del blending!. Happy birthday concord & 9th!! Beautiful stamps and dies!! Happy Birthday to Concord & 9th!!! Love your cards today - the colors are just fantastic! Thanks for bringing my attention to some products I hadn't really paid attention to before in Concord & 9th's store. Happy 1st Birthday Concord & 9th! Love the cards made today. Very pretty colours. Have another fabulous year! ooooo! I have this die, so I'm excited to get this inspiration! Such pretty cards. Love the rainbow diecuts. me ha encantado como siempre en cada proyecto nos dejas una felicidad , y entendimiento de todo lo facil que logras hacer cada detalle. I've only used that heart die for valentines, so thanks for showing it another way. Lovely ink blending! Happy Birthday to Concord & 9th! Beautiful rainbow coloured cards. Happy Birthday Angie and Greg and congratulations on a wonderful first year! Happy Birthday Concord and 9th! Your cards are lovely. Happy birthday concord and 9th! 🎉 A great company with many more years to celebrate. Stunning card! Love the colouring and die cuts, everything on your cards are just so beautiful! Can't wait for the new products! Beautiful work! Thanks for the post. Thanks for the very helpful video instructions for making your cards! Happy Birthday Concord & 9th!! What a fun month this is turning out to be! Amanda, I was really hoping you weren't going to throw out that beautiful heart left over from the first card...and you didn't! :) Both cards are a stunning way to celebrate a birthday! So pretty!! I love the second card using the left over die. Happy, Happy Birthday! Thanks for all the wonderful inspiration. Hermosas tarjetas! es un placer verte como siempre! Happy Birthday Concord & 9th, you have fabulous products! Love the soft colors on your cards! I adore that die! I have it in my crafty supplies but ahve not used it yet! Amanda!!!! Such gorgeous cards!!!! I don't own clarity stencil brushes but you've inspired me to get some. The colors are so even and perfect. They enhance the die cut images. I love 2 for 1 deals 😉. Thanks for the giveaway. Both of them are amazing!!! Both cards are beautiful and congratulations.